Get away from it all... Nestled on the edge of the White Mountains in the Western Lakes Region of Maine, this is the ideal large, lakefront log home if your idea of getting away involves heading into the outdoors and away from the crowds. During the Winter enjoy the large stone fireplace in the main room, nearby skiing, snowmobiling and ice skating on the lake. In Spring & Fall enjoy leaf peeping and hiking in the White Mountains. During the Summer enjoy the peaceful lake with private 230 ft. lakefront property, sandy water entry, swimming, large canoe, barbecue on a large deck and a hammock with beautiful water and mountain views. Indoor photos of the home and additional outdoor photos are available. When Jeff and I were in our early 20's, we started going up to coastal Maine every year in the summer. Raised in NY and southern CT, we fell in love with the quaint New England villages, the pine air, cool night summer breezes, the people, and the laid-back lifestyle. In 2001, we lived in a condo in downtown Boston and wanted to find a weekend retreat that offered lots of outdoor activities throughout the year. We had heard about the Lakes Region in Maine and decided to explore that area of Maine. The first time we saw this Log Home, set in the woods, on a beautiful lake, we knew it had everything we had hoped to find. With nearby skiing at Sunday River and Mt. Abram's and the interstate trail system of cross country and snowmobile trails - it would provide us with plenty to do during the winter. 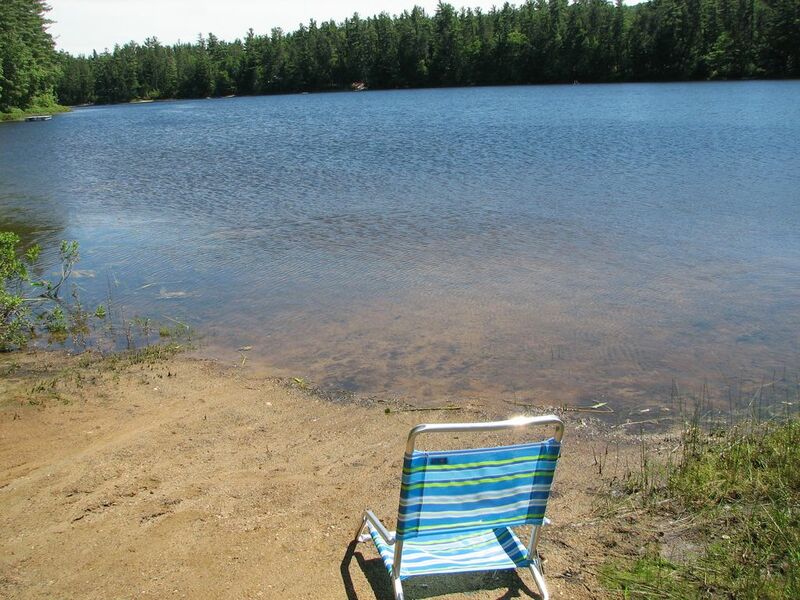 In the summer, we could canoe, kayak, swim, hike... or just relax by the lake. And, the nearby quaint New England towns of Bridgton and Bethel reminded us of why we were drawn to Maine so many years ago. The house sit on a lake and faces the sunset. Each evening, you can sit on the deck, watching the loons on the lake, as the sun dips below the White Mountains in the distance. Both bathrooms are full baths. The first floor bathroom has a bath tub (as well as shower). The upstairs bathroom has an upright shower. Canoe fits up to 950 lbs and there are 2 kayaks. There are also several life jackets. During the Winter, enjoy the large, stone fireplace in the main room, nearby skiing, snowboarding and ice skating on the lake. In Spring & Fall enjoy leaf peeping and hiking in the White Mountains. During the Summer, enjoy the peaceful lake with private 230 ft lakefront property, sandy water entry, swimming, large canoe, barbecue on a large deck and a hammock with beautiful water and mountain views.